Delta 5 featured a trio of women singing in plain, unadorned voices, signaling a de facto rejection of the notion that female singing should be as sweet, simpering and desperately ingratiating as women themselves are too often expected to be. Spawned from the same Leeds art school scene as the Gang of Four, Delta 5 employed many of the same defamiliarizing, alienating musical strategies to try to invigorate the pop song form and invest it with the potential to be a weapon of social critique -- unorthodox but insistent rhythms, wobbly bass lines appropriated from disco and funk, slogans typically barked in unison for lyrics, intermittent explosions of atonal guitar punctuating the song in lieu of verse-chorus structure. (Nevertheless some of these have been made familiar to the point of fatigue by the Gang of Four's recent slicker successors.) 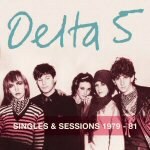 The main difference between the bands is that Delta 5 featured a trio of women singing in plain, unadorned voices (similar to their contemporaries, the Raincoats), signaling a de facto rejection of the notion that female singing should be as sweet, simpering and desperately ingratiating as women themselves are too often expected to be. This hectoring vocal approach suits the topics of these songs, which typically harangue negligent relationship partners with a battery of complaints, threats and insults: "Who forgot to phone last Tuesday? You. / Who took me to Wimpy's for a big night out? You" (from "You"). "Mind Your Own Business", the bracing opening song on the disc (and a veritable paradigm for Erase Errata's sound), repeats its troubling litany -- "Can I have a taste of your ice cream? / Can I lick the crumbs from your table? / Can I interfere in your crisis?") with a cacophony of overlapping voices utterly lacking in harmony, emphasizing the simultaneity of the contradictory feelings implied, the anger and neediness and desire and spite, while presenting palpably, in the resultant chaotic babble, just how paranoid and claustrophobic a relationship beset by such questions can feel. This song encapsulates the band's approach, which it repeats in subsequent songs on this disc without ever really doing it better. "Mind Your Own Business" is the kind of song so immediate in its impact that it makes critical mediation of the sort provided in the previous sentences utterly unnecessary; you feel in the listening experience the ideas the group seeks to convey. Some of the other tracks aren't always that successful; at times some songs' compositional elements can seem frustratingly out of control, like an umbrella blown inside-out. In the liner notes that accompany this collection -- which compiles the A and B sides of three early singles, seven songs from radio sessions with John Peel, and three tracks from a Berkeley, California, show recorded in 1980 -- Greil Marcus points out that Delta 5's songs cut both ways, against the accuser and the accused, which leaves a listener with nowhere to comfortably place her sympathies. What results is a sense that relationships themselves are structurally flawed, an argument that the unstable musical structure, the stumbling drum patterns and wearily looping and dueling runs of the group's multiple bass players and staccato guitar interjections, reiterates. So after making it quite clear that coordination between the sexes is virtually impossible and suggesting relationships inevitably slide into mutually degrading stalemates of recrimination, there is something grim and ironic about such songs as "Delta 5" that then invite you to dance. Like the band's dismantling of love songs, its approach to dance music is spiked with contradiction and dialectic tension. Just as contemporary social conditions make relationships untenable and ordinary love songs hollow lies, they also force us to consider whether dancing integrates or isolates, whether it epitomizes sexism or undermines it, whether it is an act of aggression or ritual supplication. And likewise, "Makeup", a consideration of the everyday function of cosmetics, asks the deceptively straightforward question, "Do you wear it or does it wear you?" Through these false dichotomies and irresolvable inconsistencies Delta 5 manages to be political without being polemical, which is to say its music encourages us to regard perhaps most particularly the mundane things in our lives with critical scrutiny but without the ideological cant that mints received opinions in the first place.